Kehilat Chovevei Tzion is determined and dedicated to providing a meaningful Shabbat experience for all our congregants, including our children. To that end, from Chovevei's inception, children's programming has been our central focus. No other aspect of our shul has been more carefully planned, with our highly active and engaged Youth Committee crafting a program that will safeguard, educate and entertain our children. We hope that your children will participate and that you will support our program! Yehuda and Rebecca are incredibly talented and passionate leaders who have extensive experience working with children and teens. Yehuda was formerly the Director of Teen Programming at Or Torah and has also had leadership roles at Bernard Horwich JCC and other organizations. He received a degree in Nursing from Loyola University and is currently an Emergency Room Nurse at NorthShore Highland Park Hospital. Rebecca also has extensive experience working with children and families. She graduated from the University of Chicago's School of Social Service Administration, and now works as a Child Welfare Therapist at Jewish Child & Family Services. 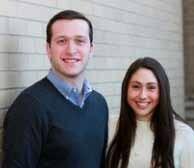 Yehuda and Rebecca have reinvigorated our youth programming, and we are fortunate to have them as our Youth Directors.